Buick Regal Forum : 2011 Buick Regal Forums > Buick Regal Forums > Buick Regal Classifieds Section > WTB: '12-'17 Regal GS -OR- '10-'13 Lacrosse 19" wheels!!! 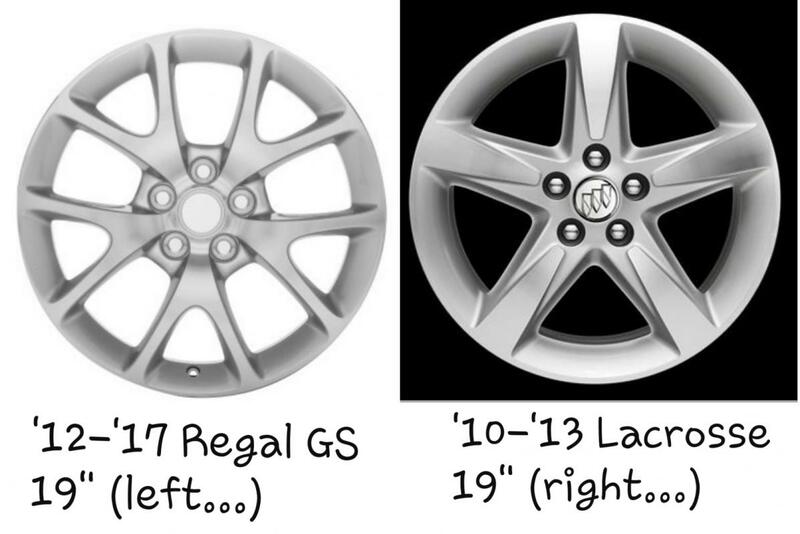 WTB: '12-'17 Regal GS -OR- '10-'13 Lacrosse 19" wheels!!! As the title says, I am looking for another set of 19" wheels for my '12 Regal GS. I am looking for a set of either the stock Regal GS 19's, or a set of 19" 5-spoke wheels from the '10-'13 Lacrosse (pictured below...)... I need a new set for my summer/nice weather tires, and keeping my current stock beat up set for my winter/snow tires. Obviously closer to the Albany, NY area preferred, but will pay for shipping if I have to for the right set... As close to mint as possible wanted, and coming with good center caps a must!!! So if you got either set of either of these you or someone else you know has for sale, hit me up!!! I have tons of positive feedback on Ebay and Facebook groups such as LS4 Nation, a few of the SyTy (Syclone & Typhoon) groups, and many music gear groups. Just ask for references if you feel you need them. So like I said, let me know what you got!! !